I’m a big, big fan of most Japanese games (except the weird ones. Ok, maybe some weird ones too.). Probably my favourite genre, thanks to growing up playing Final Fantasy, is JRPGs. The way they blend story with turn-based combat provides a very enjoyable recipe with which to play. 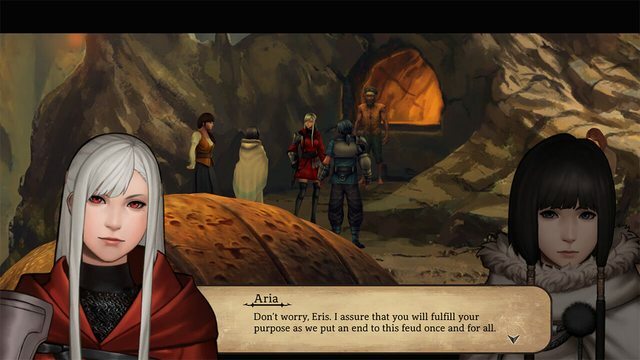 Legrand Legacy: Tale of the Fatebounds, made by SEMISOFT, is one such game. If you are frequent readers of Hyper Light Up, you might remember the game from our Gamescom 2017 interview with its developers. While the game was supposed to be out by the time this review airs, it has been postponed so it can come out more polished. As such, this preview, while indicative of the whole game, will not touch on any bugs or anything like that, since they will probably not be there by the time the game is released. In Legrand Legacy we follow the story of Finn, a man who has lost his memory and is forced to fight in the arena. He is quickly freed by an old man who enlists him to protect him on a mission. As the game progresses we will meet more characters and follow their stories as well, in classic JRPG fashion. Also in classic JRPG fashion, we soon learn that we are caught up in something much bigger than we originally thought. The gameplay is split in two parts. The first is wandering Legrand Legacy’s map and cities. The map is hand-drawn and very pretty, and encompasses an enormous swathe of the world. It is used to traverse from city to city and also to go to new dungeons and areas of interest. Cities are where we can refuel and take on side-quests. Each city that you will encounter is very different from each other. What’s more, every city feels different. The main factor in this distinction is every city’s aesthetic. You have the standard medieval royal city. You have your desert city. You have an underground city. What’s more, there are some tiny quirks each city has that distinguish them from one another. For example, in one city you can find people speaking in a code language that you can learn. To generalize, what I really liked about Legrand Legacy is its world-building. It seems like the developers put a lot of thought into how every city works and where it is located. What’s more, the game also builds up the world’s conflicts well, planting small seeds about them from the very start, then escalating to where you are also part of it. The second part of gameplay is combat. For fans of JRPGs, combat should be easy to grasp, with a few nice changes from the norm. One such change is the fact that you can initially not see what you are fighting. Enemies on the area you are on, are depicted as a black ball of smoke which comes charging at you. Once you and the smoke meet, the battle begins and you get to see who your enemy is. You can also surprise your enemy or be surprised yourself, gaining an extra turn once combat begins. To do that, you need to attack your enemy from the back. The combat itself requires an understanding of rock-paper-scissors. Basically, every creature has a melee and elemental type. This means that every type of magic or melee attack you do will either do normal damage, be super effective or not very effective. On top of that, every character you control has his own special ability that he can do once a meter fills up, which is done once you battle enough. You can also choose where to position your units, with the ones at the front being the ones who get melee attacked first. This adds another nice layer of strategy. Once you win a battle, you get experience points which are used to level up. Once you level up, you can upgrade your stats. An interesting thing here is that every stat is useful. Legrand Legacy is not one of those games where a character can level up just his attack damage and hp and be a tank. While you can play the game that way and some stats are more important than others for each character, you need to upgrade all of them if you want to get new attacks. To be more exact, the way you get new attacks and skills is by reaching a certain stat level. For example, Finn can get a new attack if he levels up vitality to 15 and dexterity to 10. In terms of graphics and sound, the game is great. The game blends hand-drawn 2D backgrounds with its 3D models, mixing moderns and retro art. Moreover, the soundtrack is as epic as it should be for a JRPG. The only thing I didn’t like in Legrand Legacy is its writing. The dialogue is repetitive and bloated, with random interruptions. For example, the game wants to make sure we know Finn is originally clueless, while the second character we meet, Aria, is bossy and kind of annoying at first. Although the game could have told me that a few times through subtle means, it insists on reminding me quite often. Usually by interrupting more meaningful dialogue. Generally, while the groundwork for a good story is in there, it is covered up by way too much talking that has no point. 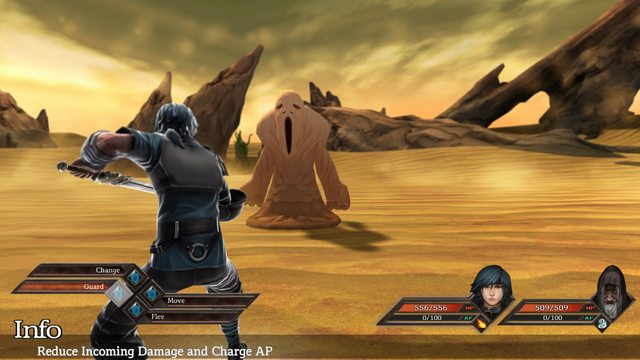 All in all, Legrand Legacy is a fun game with fluid combat and an entire world to explore. While the story does make the game drag a bit, it is still an experience worth your time if you are a JRPG fan. What’s more, there’s a big chance that the game’s developers will use the time they have since they postponed the release to improve on the story a bit too. Currently, the game has a tentative release window of Q4 2017, so if I were you, I’d keep it in my wishlist. You can find Legrand Legacy on Steam.